Blending the lightness of the California coast with the heavy fare of steaks and whisky seems improbable, but S + W does exactly that. 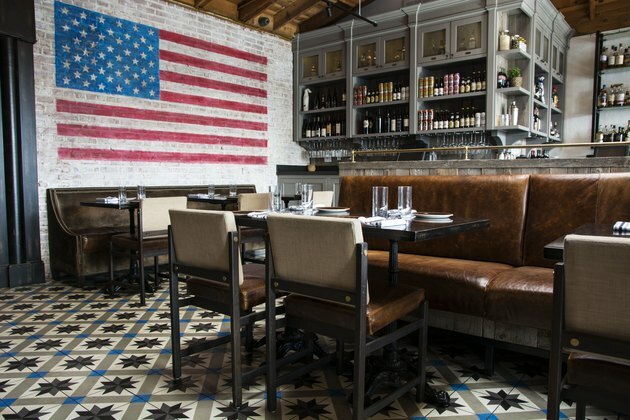 Drawing on water-hued accent shades to relax industrial textures, the Hermosa Beach restaurant's look combines the casual sensibilities of the Pacific shore — which is just a few paces away — with the rich, dark materials that are usually associated with a meat-centric menu. It's a complicated balance that designer Stephen C. Knight of Bishop Pass also managed to achieve in a small, confined space. "We couldn't really knock out walls, so we decided to embrace them," Anthony Agriam, the owner and creative director of Bishop Pass, said. "We wanted a residential component [that's] simple, with a modern silhouette." The team used the ceiling's raw beams and the back wall's exposed brick as foils to gray cabinetry, and they choose vibrant floor tiles that would seem at home in a private address. Then they installed large windows to shed sunlight on chocolate leather booths and wood-and-pipe shelving. It's a clever interpretation of light and dark, where every touch seems to have a perfect counterpart. Bringing light into this small space was imperative, so large windows were installed at the front of the restaurant. The design wanted to use the light from the windows to balance the dark components throughout the rest of the building. "We wanted that one feature to tie in all the light coloration. We introduced the blue color [of the tile] because we were pulling this palette off the Big Sur coast," Agriam said. 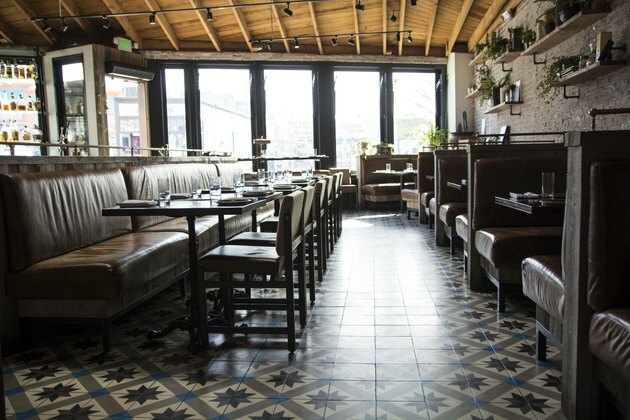 Granada Tile supplied the flooring, and walnut-framed chairs by Thomas Hayes were upholstered by April Robb Fabrication. 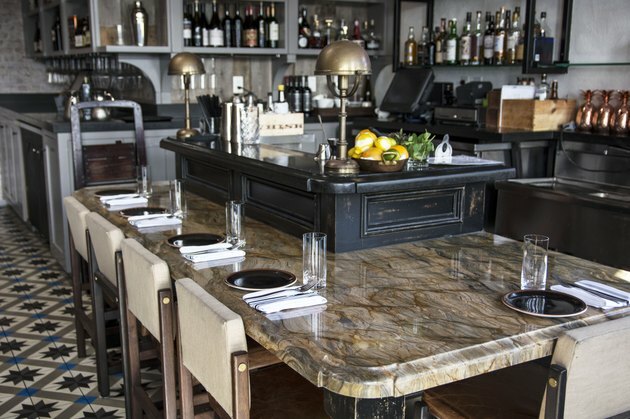 Brass countertop lamps and sconces by Circa Lighting illuminate a marble martini bar by Ombra Di Caravaggio. 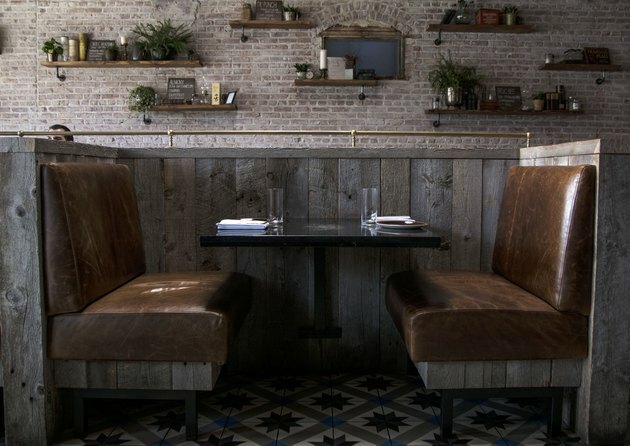 Booths are lined with sun-bleached oak barnwood, and the chocolate-colored seating was provided by Omnia Leather. 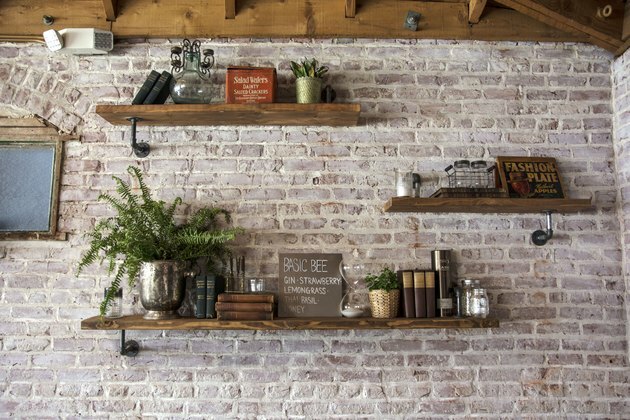 Bishop Pass customized the shelving "to evoke this sort of handyman, made-by-a-farmer feeling," Agriam said. Antique pieces and plants give the finished look a homespun feel.